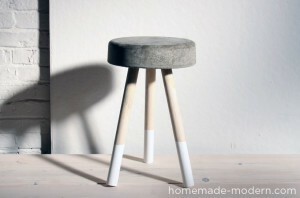 This easy 5 gallon stool is made with little more than concrete and dowels. If you’re a fan of minimalist design, you should definitely give this a try! A 5 gallon bucket provides a mold that sets the concrets, holding the dowels in place with enough strength that it can hold the weight of a person. If you have some left over material of these supplies in your house, you can build a cheap chair out of them, otherwise we recommend ordering the supplies online by following the above links. Step 1: Take your 48” long wooden dowel and cut it into three separate 16-inch pieces. 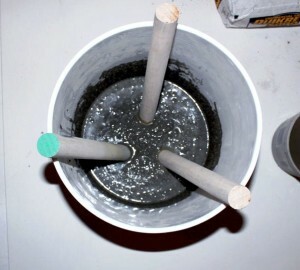 Step 2: Pour concrete in a bucket, add water, and stick the three pieces in so that they point towards the center of the bucket. Step 3: Wait around 20 hours for the concrete to dry. Step 4: Pull the chair out of the bucket. Step 5: Use sandpaper to smooth the rough edges. Step 6: If the legs of your chair are not equally long, use some pipe caps and some washers to fix the difference. There are of course alternative options you can consider too. You could pour epoxy into the bucket and base seat chair on that. You may have to cover the inside of the bucket in paper or aluminum foil first, to avoid ending up with the epoxy stuck to the bucket itself.